Imagine being able to easily change the offset of your wheel to fit different applications by simply changing out the hex! Introducing a true next generation 2.8” wheel design from Pro-Line – the Raid 2.8” Removable Hex Wheel for all 2.8” tires! You can go from the included 12mm narrow offset (2wd Stampede®/Rustler® Rear) to the included 12mm wide offset hexes (2wd Stampede®/Rustler® Front and 4×4 Stampede®/Rustler® Front and Rear) quickly and easily. Also imagine being able to replace a damaged wheel hex without needing to replace your glued tires (6335-00 Replacement Hexes) or even upgrading your wheels to 17mm wheel hexes (6336-00 Sold Separately) for extreme use! 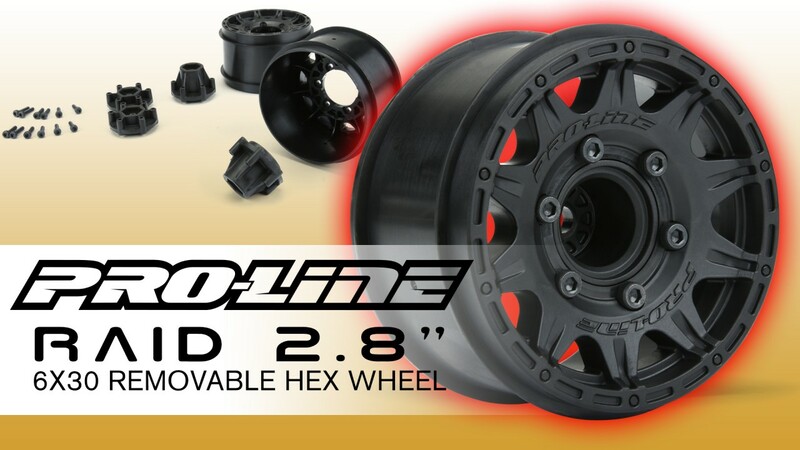 These new Raid 2.8” wheels accomplish all of this and more by using Pro-Line’s unique 6×30 interlocking hex design that is secured to the wheel by 6 M3 screws that are spaced 30mm across. The built-in adjustability and ease of use make this a new must-have wheel for bashers everywhere! PRE-MOUNTS AVAILABLE with this wheel! If you have questions please feel free to contact us or if you want to order these or any other great #prolineracing items you can go to https://www.prolineracing.com and buy, or click the Shop Locator to find a hobby shop near you.